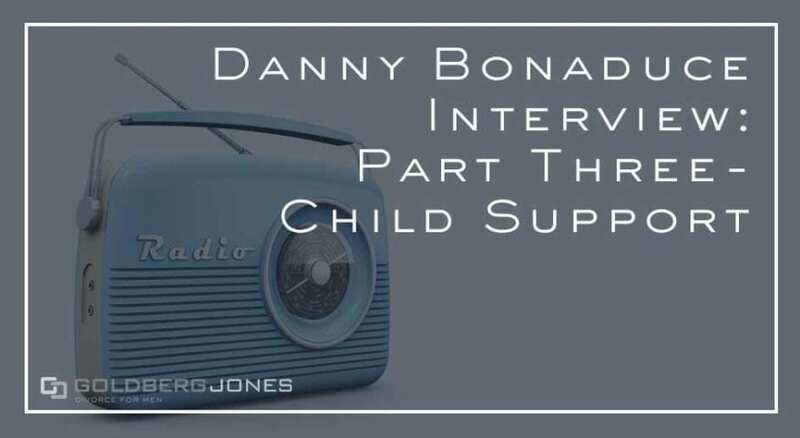 One the first Wednesday of every month, our founding partner, Rick Jones stops by The Danny Bonaduce & Sarah Morning Show to take questions from callers on all aspects of family law. Normally Rick and Danny take the questions from callers, but we thought it would be a fun adventure to turn the tables. Just for kicks, we decided to ask Danny about his own extensive experience with family law. Danny: “No, and I’ll tell you this, you scared me on this one. I don’t care for the care and feeding of my 17-year-old son. I don’t like the way that’s going. I pay $3,000 in child support every month, and have for ten or 12 years, since he was a little boy. “And I asked Rick about it, and he said, be really careful, she could go back to court and get more money. Not less. More. And I went, wow, I really thought, “Check with Rick before you do anything.” Because I didn’t think about that child support. [I thought] it was carved in stone, and it’s not necessarily. “If you can prove that the person paying the child support–and there are two sides to this–is making way more money, they can go back to court and get more money. “And on the other hand, on the flip side of that, I learned all this from Rick, that if the person receiving the money, because they didn’t make anything, now makes equal or more money, you can go to court and get some of that reimbursed to you. $3,000 per month child support for daughter. $3,000 per month child support for son. Danny: “We get calls all the time where somebody will say, you know I’m paying my child support and it’s killing me. It’s $800 a month. Now that guy’s working hard for that money and it is killing him, but what I hear, is, ‘I’m getting screwed here so bad!’ But it all has to do with how much you can afford to pay. “The thing that Rick taught me, the judge is not out to get you. Rick said this with a straight face and since then has said it many times. So I now believe it. The judge is just a guy. He doesn’t hate you or love you. He has a job to do and he’s going to do it to the best of his ability. “And I got to tell you, I never think of lawyers or the judge as people with just a job to do. They come in and do what’s right and then go home, and that was a refreshing and satisfying idea. “The idea, although I hope not to be in court again. The idea that the judge doesn’t hate me just because I’m the defendant or the plaintiff, or what it is, that doesn’t get [talked about]. Danny: “My daughter, her name is Countess Isabella Michaela Bonaduce, and I thought this would be a private thing. My ex-wife is a crazed royal follower, follows their weddings, their birthdays, when kids are born and all that stuff. Related Reading: Part 4 – Anything to Add?